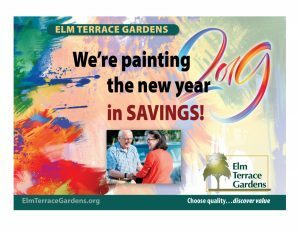 Elm Terrace Gardens is a faith-based, not-for-profit community with a well-established reputation for quality lifestyles and care. Our Life Plan community offers exactly that – a plan for life – no matter what happens if health needs change. We offer a full continuum of care on campus, including personal care and a brand-new, purpose-built Aspire Memory Care community. Plus, we also offer traditional long-term care and skilled nursing services, as well as short-term rehabilitation for those who need additional care and support following an injury, illness or chronic condition.